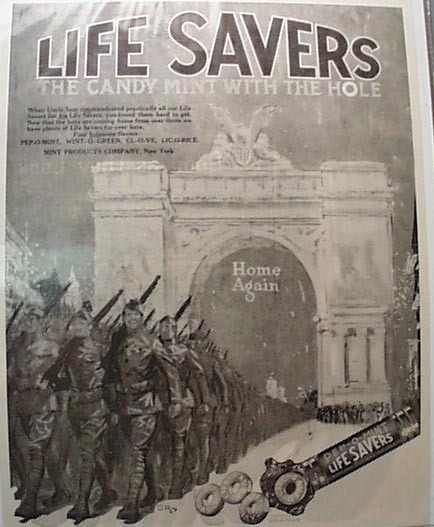 1919 WWI Life Saver candy ad, shows the boys coming home & says after Uncle Sam taking all the life savers for the troops, you can now get life savers for yourself. Very nice black & white ad from Feb 1919. 10 x 13 1/2" Mint condition, Postage & handling on ad in USA if envelope shipping is ok, is 1.75 otherwise 3.95 for a box to ship it in. The photo of this ad was taken with it in plastic & may show some crookedness or glare that is not on the ad. It is very nice. Items Similar To "1919 WWI Life Saver Candy Ad"